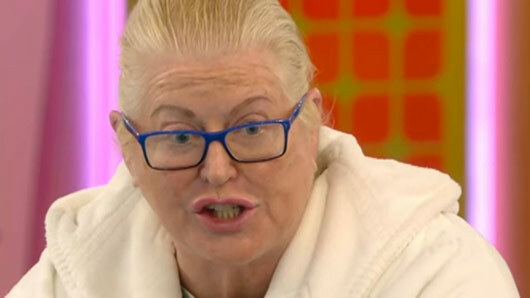 The wrath of Kim Woodburn was back in full force during last night’s Celebrity Big Brother live feed. Fans have been eagerly anticipating another round of fireworks after the iconic “ADULTERER!” outburst that took place a couple of weeks ago. On the contrary, however, the How Clean Is Your House star has been surprisingly calm since her last rage. Until now. Yes, angry Kim fans will be pleased to hear that she made an almighty return during Tuesday night’s live feed. The six celebrity housemates had just taken pat in The Big Brother Awards, in which housemates could vote for the winners of titles, including ‘Biggest Flirt’ and ‘Biggest Argument’. It was all being taken in good humour until the celebrities were asked to vote for the ‘Naughtiest Housemate’. Nominees included Jedward, for painting the bathroom mirror with shaving foam, and Kim, for her legendary row with Jamie O’Hara. …And then it all kicked off. “Fair enough. I accept,” Kim began. “I thought we’d stay friendly and make it lighter, but obviously we’re not doing this. I didn’t start this. I was going to stay friendly. “I was going to [vote for] Jedward because they’re naughty. But you brought this up. Unfortunately, the live feed cut the audio during the shouting match but fans could have sworn they heard Kim used her beloved “gang-handed” insult.